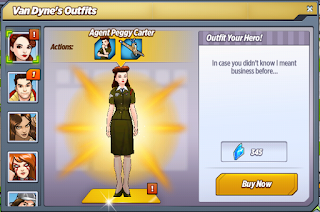 Agent Peggy Carter is a new outfit for Peggy Carter which you could buy during the Legends Assemble! Special Event 2017. 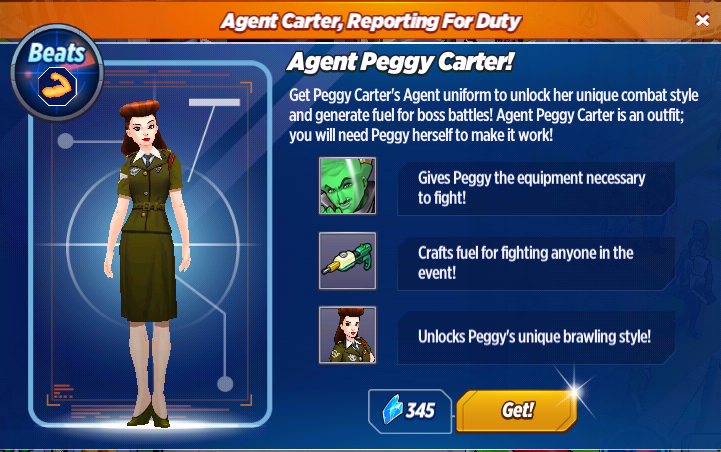 It allows Peggy Carter to take part in combat and also gives her actions to drop fuel for fighting bosses! Agent Peggy Carter: The Academy is facing a three-pronged attack from a coalition of evil involving Hydra. We need a proper battle strategy. I thought my old SSR uniform might get me into the proper frame of mind. 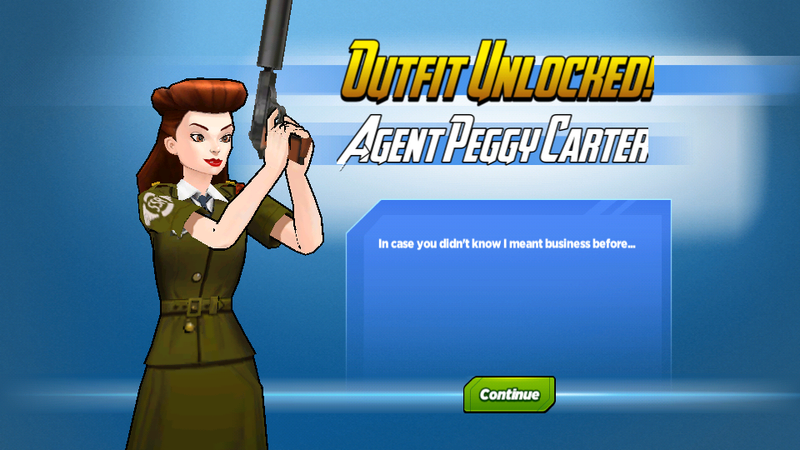 Agent Peggy Carter: It's what?! Spit it out, Rogers. 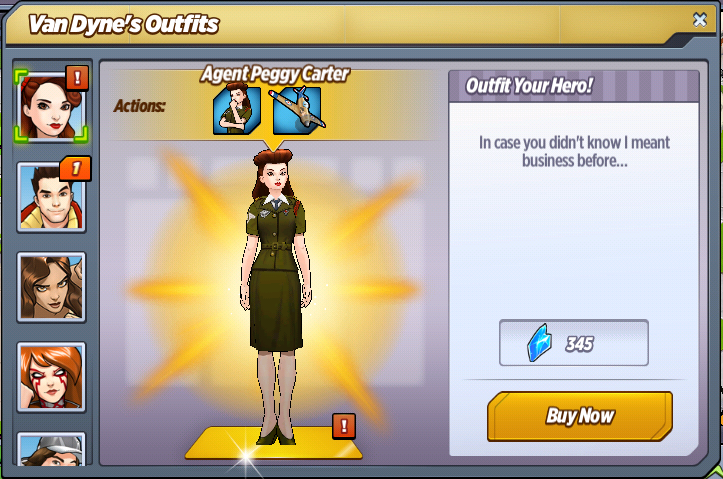 Phil Coulson: Is that your original SSR uniform?! Agent Peggy Carter: It is. Phil Coulson: Can I get a picture? 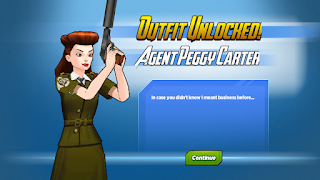 Agent Peggy Carter: I'm in a bit of a rush, but I suppose so. Where would you like me to stand? Phil Coulson: I want you to take a picture of me! 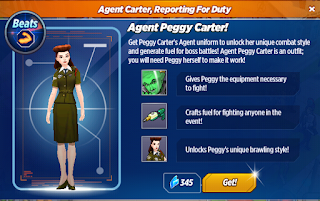 I need to remember the look on my face the first time I saw Peggy Carter in her original SSR uniform! Agent Peggy Carter: I'll help you devise a strategy to defeat the invading forces. Nick Fury: I didn't ask for your help. Agent Peggy Carter: That was your first mistake. Agent Peggy Carter: I don't cheat. I don't have to. Nick Fury: I cheat all the time. Agent Peggy Carter: It's been too long since I brushed up on my pilot skills. Do you think Director Fury would mind me bringing in my own plane? War Machine: You know he's a control freak. He won't even let us fly the Quinjet without saying the magic word. Agent Peggy Carter: Thank you. It truly is just like riding a bike. Falcon: Who taught you how to fly like that? Agent Peggy Carter: No one would teach me, so I taught myself. Agent Peggy Carter: There are no limits to the things a lot of work and a lack of fear can achieve. Nick Fury: Let's get back to planning a strategy for defeating these invading forces. Nick Fury: I just wanna protect my school. Nick Fury: I haven't slept in three days. Agent Peggy Carter: I see what you did there, Rogers. WWII Captain America: We always did make a great pair. Agent Peggy Carter: As long as your remember who's in charge. Agent Peggy Carter: I'm always in charge, Steve. WWII Captain America: Yes, Ma'am. What do you think of Agent Peggy Carter? Did you buy her? GotG Vol. 2: Groot's Galactic Crate! Legends Assemble! Character Profile: J.A.R.V.I.S. Legends Assemble! Spectacular Science Crate!